What is a Christian? There is both a broad definition and a theological definition. The broad definition can be found in Webster’s Dictionary. This definition is “a person professing belief in Jesus as Christ, or in the religion based on the teachings of Jesus.” The term Christian must have been coined by the heathen population of Antioch in derision of the followers of Jesus. “And the disciples were called Christians first in Antioch.” (Acts 11) The King James Version will be used exclusively in this paper. The broad definition of Christian includes every religion professing belief in Jesus as Christ or based on His teachings. In this broader definition, this includes every church making such a claim. After the death of the Apostles, the church broke into many factions, each with their own special set of beliefs. Each, though, based their teachings on those of Jesus. In the early fourth century, Constantine took Rome by the sword–killing his wife, first born son, nephew, and thousands of others. But, Constantine wanted to also stand as the spiritual head of all Rome. He went to the pagan priest, Sopater, seeking forgiveness for his sins; but, was told they were too grievous to be forgiven. By this time the Christian church was severely disorganized and held to many different beliefs; but, were a growing religion. When Constantine went to a Christian Bishop, he was told that he could be baptized and forgiven of his sins. He decided to make Christianity the State Religion; although he was an un-baptized pagan Emperor. He organized the Council of Nicea in 324AD and stood at its head. After months of bickering over the true character of God and Jesus, the council adopted the Creed of Saint Athanasius (pagan Trinity), organized the universal or Catholic Church, and stood as its absolute head. Constantine remained a loyal follower of the sun god until he was on his death bed when the Bishops were finally able to baptize (or sprinkle) him. This creed declares, “The Father incomprehensible, the Son incomprehensible, and the Holy Ghost incomprehensible.” If Jesus is incomprehensive, how can one believe in Jesus as the Christ? Jesus taught, “3 And this is life eternal, that they might know thee the only true God, and Jesus Christ, whom thou hast sent.” (John 17) Without a correct understanding of God and Jesus no man can have hope of salvation. But, even with these theological defections, Catholics can still lay claim on being Christian through the broad definition of a religion based on Jesus teachings. When Martin Luther broke away from the Catholic Church and was cut off, the Catholics simply considered his movement as a cult. “Cult” is defined by Webster’s Dictionary as “a system of religious worship or ritual.” The Protestants in return, when the King James Version of the Bible was printed, capitalized “MYSTERY BABYLON THE GREAT, THE MOTHER OF HARLOTS AND ABOMINATIONS OF THE EARTH” directed at the Catholic Church. They could make no claim to divine authority; but, by the broad definition they are Christian. Some ignorant bigots have said that “Mormons” are not Christians; but, a cult. Every religious system is by definition a cult. The statement that “Mormons” are not Christians is a blatant falsehood. Often people with a set agenda that cannot properly deal with things contrary to their beliefs resort to telling falsehoods to cover up their own ignorance and errors. The term “Mormon” is not the proper name of the church; but, over the decades has been used in derision. The proper name is The Church of Jesus Christ of Latter Day Saints. The name is sufficient to inform honest inquirers whether “Mormons” are Christians. Joseph Smith wrote, “We believe in God, the Eternal Father, and in His son, Jesus Christ, and in the Holy Ghost.” The ignorant bigots that make this claim are themselves, by definition, cults. There is a fundamental principle required to be a true minister of Christ. No follower of Jesus could claim to be a minister of His without a proper calling by revelation and an ordination by one holding as high an office. Not even Jesus was exempt from this Law. “4 And no man taketh this honor [of the priesthood] unto himself, but he that is called of God, as was Aaron.5 So also Christ glorified not himself to be made an high priest; but he [the Father] that said unto him, Thou art my Son, today have I begotten thee… 10 Called of God an high priest after the order of Melchisedec.” (Heb. 5) Jesus became the son of God by ordination to the highest office in the order of the Sons of God (Melchisedec Priesthood). There only two priesthoods noted in the Bible. The original and highest officers were of the Melchisedec Priesthood. The highest office is that of first degree Apostle and Lawgiver. Adam held this office; as it is evident the law was first given to mortal man through Adam. Who can doubt that Cain violated the law when he killed his brother Able? The next is that of third degree Apostle or Ambassador. Peter’s elevation left two absences to the Twelve. “23 And they appointed two, Joseph called Barsabas, who was surnamed Justus, and Matthias.” (Acts 1) Twelve form a quorum of this office. When the dispensation was lost to the Jews (after the martyrdom of Jesus), and moved to the gentiles, the duty of the Twelve was to preach the gospel to the world. “15 And he said unto them, Go ye into all the world, and preach the gospel to every creature.” (Mark 16) While Peter addressed his epistles to the whole church, Paul (a third degree Apostle) addressed his to those in his jurisdiction. The lowest is that of fourth degree Apostle or Evangelist and their mission is to only one nation. “8 And the next day we that were of Paul’s company departed, and came unto Caesarea: and we entered into the house of Philip the evangelist, which was one of the seven; and abode with him.” (Acts 21) Seven form a quorum. The second order is that of Priest; and of this office there are two degrees: High Priest and Elder. High Priests have even been spoken of under the name of prophets; although they do not hold the Prophetic Office. All of the Twelve, except John, were martyred by 69AD. John was banished to the Isle of Patmos in 97AD and returned to Ephesus shortly after. Some believe he died in 99AD. Jesus allowed John to tarry on the earth. “23 Then went this saying abroad among the brethren, that that disciple should not die: yet Jesus said not unto him, He shall not die; but, If I will that he tarry till I come, what is that to thee?” (John 21) John is somewhere among us today. As this famine for the word of God was to last 1,260 years, it follows that the Melchisedec Priesthood and the gospel of Christ would be returned to earth by an angel from heaven at the end of that time. “6 And I saw another angel fly in the midst of heaven, having the everlasting gospel to preach unto them that dwell on the earth, and to every nation, and kindred, and tongue, and people.” (Rev. 14) Exactly 1,260 years after the first Pope was established, Joseph Smith organized the Church of Christ on April 6, 1830. Only a church that holds a legitimate claim to the Melchisedec Priesthood can be a theological or true Christian. Remember, the term “Christ” means ordained or “anointed.” To be properly anointed, one must be called by the spirit of prophecy and ordained under the hands of one holding as high a priesthood; as was Aaron to the Levitical Priesthood and Joshua to the Melchisedec Priesthood–as was every officer of the kingdom of God throughout the Bible. Look about you. Are there any in your church that claims to hold the Melchisedec Priesthood? If not, none have entered the kingdom of God; and cannot lay claim on being true, theological Christians. 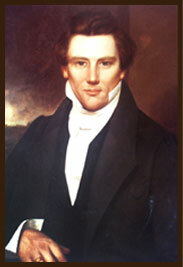 Fortunately, after the 1,260 year famine of the word of God, the Melchisedec Priesthood and original gospel of Christ was restored through Joseph Smith. 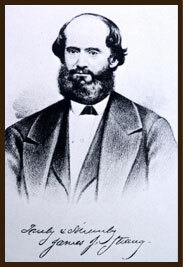 Before Joseph Smith was murdered, with the help of the government of Illinois, on June 27, 1844, he appointed James J. Strang as his successor about a week earlier in compliance with the law of God. “4. But verily, verily, I say unto you, that none else shall be appointed unto this gift [as Prophet] except it be through him; for if it be taken from him he shall not have power except to appoint another in his stead. 5. And this shall be a law unto you that ye receive not the teachings of any that shall come before you as revelations or commandments. 6. And this I give unto you that you may not be deceived, that you may know they are not of me. 7. For verily I say unto you, that he that is ordained of me shall come in at the gate and be ordained as I have told you before, to teach those revelations which you have received and shall receive through him whom I have appointed.” (Doctrine and Covenants, Section 43) The same hour that Joseph died at Carthage Jail in Illinois, James J. Strang claimed to have been ordained under the hands of angel(s) as required by the law of God; although he was some 400 miles distant. The Letter of Appointment arrived by regular course of mail on July 9th; and is now in Yale University Library. James was the only man to ever claim a proper calling and ordination; although others usurped the authority of God and attempted to stand at the head. The simple test of whether you are a true, theological Christian is whether you have been confirmed into the kingdom of God by one having a valid claim to the Melchisedec Priesthood.